Plenty of amenities & long level pull-thrus. Central to museums, the Red Desert, Snowy Mountain Range, Outlaw Trail Loop, Oregon & Mormon Trail Loops & Aspen Alley. Plus some of the best walleye fishing in the west. Stayed here in September 2018 for one night. Good for an overnight stay and has nice big easy in/out spaces. All gravel which is not real good if you have a dog along. Not many places to walk your dog nearby either. We spent one night here on our way back East. The woman at the front desk was very unfriendly when we checked in. The sites are pull-thru which was convenient so we did not have to unhook the car. The park is all gravel without landscaping. Hookups worked fine. However, I would not recommend this parks for dogs unless you just plan to sleep and get back on the road. There are a couple small enclosed dog areas and the one we used was dirt no grass. Literature warned not to let your dogs go on the "minimal" grassy areas in park. WiFi worked okay we did not use the cable, restrooms, etc. We just spent the night and back on the road. We stayed 1 night while passing through on I-84. The park is a short drive from the interstate (Exit 211: BUS I-80/US 30) along paved business & rural roads. The interior roads are gravel. They are wide, flat with sufficient radii turns making maneuvering larger RV’s fairly easy. The entire park is a large, flat, open area with a gravel surface. There is a mixture of P/T and tent sites. Most, if not all, of the P/T sites were long enough to say connected to a toad. The RV sites are only separated by the utility connections but there was sufficient room to open slides. This park seems to understand the simple concept of the importance of a flat, level site as the sites were generally level and flat. They have full hook ups – water, electricity (50/30/20 AMP), & sewer. The utility connections were towards the middle of the sites depending on where you decided to park. The sewer connection was above ground making it difficult to establish a downhill flow depending on discharge point. Sites have an outside table. Site orientation didn’t allow RV’s to cast shade onto the patio side on our site. There were no trees in the park so there were no obstructions to satellite reception. The park information didn’t mention anything about broadcast channels but listed 24 cable channels (that were subject to change) with the 4 primary networks coming out of Denver. Didn’t try to get any broadcast channels. The park provided WiFi was weak but there was a strong wind. It was password protected. Didn’t try our Verizon WiFi hotspot or the NET10 phone so don’t know about reception. There were a couple of designated fenced pet areas with a sparse dry grass surface located along the back perimeter of the park. There were bag dispensers and collection stations for waste in the fenced pet area but nothing throughout the park. There was sufficient area to walk dogs along the park’s roads. For being in a hazardous/severe weather area, there was no underground storm shelter. None of the structures in the park were identified as a severe weather shelter. TIP: The park guide warned of “Wyoming’s winds which can be strong and unpredictable!” They recommended not to leave any awnings extended. Basically a large gravel parking lot with hookups and picnic tables devoid of any vegetation. However, our pull-thru site was level and the utilities worked well, including the wifi (which was slow however). Facilities are old, but seemed fairly clean. The restrooms were OK, but could stand to be cleaner and updated. The laundry area was huge and machines decently priced. There was a very basic mini golf on site that appeared to be in need of some TLC. Staff was friendly enough, and check-in was easy. Eateries are scarce on this end of town, so grab something at the Walmart exit if possible. While nothing about the park is awful, it is very basic and appears to be past its prime. Would probably not stay here again unless absolutely necessary. The campground is set on a hill just off the highway and suited our travel schedule. The large gravel lot was not attractive, but each space allotted was adequate for our trailer and we were only there overnight. The restrooms were good. I would definitely stay there again if traveling through the area. 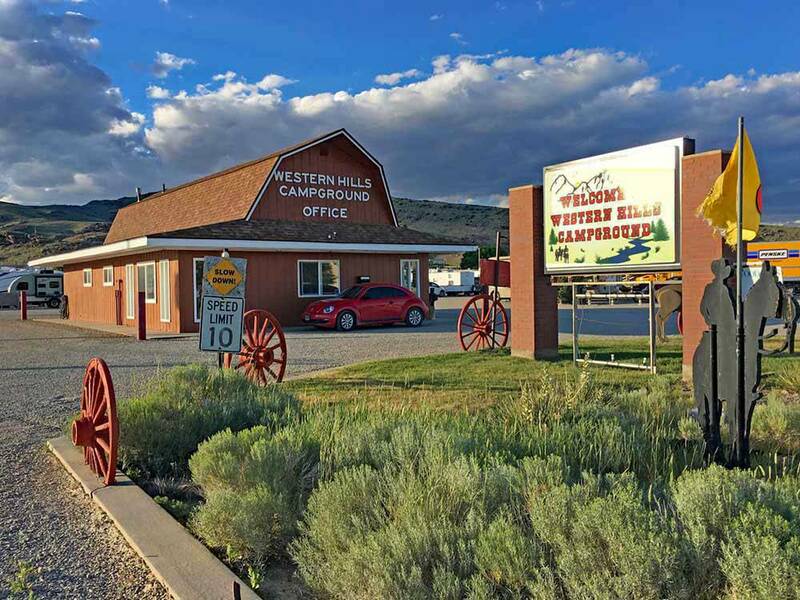 My husband and I are on our way from Cave Junction, OR to Savannah, GA and found Western Hills on Good Sam Website. We were late arrivals and were treated with respect. Would definitely stay here again. Great stop for traveling through. Nice wide level pull through sites are gravel. Nice friendly staff. The staff was very friendly. The park is big rig friendly. The park is a great overnight stop. It was priced reasonably. 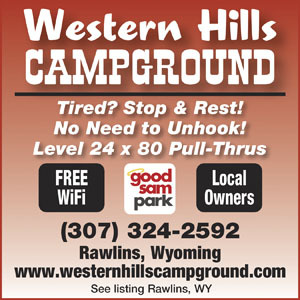 We've been camping for years now and have been to just about every type of campground out there. This was a late afternoon decision to try and stay at this one and I regret even pulling in there. The front desk girl was incredibly rude and was only doing what she had to do. When I discovered their wifi didn't reach to the site I'd payed for, they made no effort to help. After an apparent misunderstanding, the manager also got very irate and accusatory about his "gal". I left and would never use this place under any circumstances. They made no effort to assist with any handicap needs and if you have any disability, you'll be left out in the cold. This place is nothing but a gravel parking lot with hookups and a staff that has some very serious attitude issues. Avoid at all cost. I'd rather ride out a tornado, than stay in this dump. All gravel facility, close to interstate and railroad. Good for overnight, not a vacation site.